Weight loss surgery is becoming increasingly more popular in the fight against obesity. It is a big decision to undergo surgery so shouldn’t be something that is entered into lightly. Generally it should be used as more of a last resort where many different types of conventional diets have been tried and haven’t worked for you. It is also usually for those people who have a lot of weight to lose (obese) rather than simply wanting to be a celebrity style Size Zero! Weight loss surgery is usually seen as a more permanent solution to weight problems and can put an end to that constant cycle of Yo – Yo dieting. The Gastric Band is a popular procedure because it is a less invasive operation than other surgeries such as the bypass or sleeve and should you change your mind in the future the band can be removed. 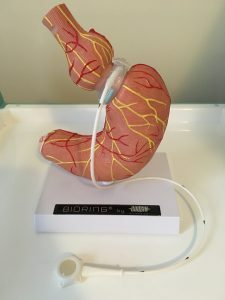 A silicone band is placed around the top of the stomach and the action of the food passing through the band stimulates nerve endings in the stomach wall helping reduce hunger. If big portions and not feeling full are your issues then the band is a good choice. The band is a fairly straightforward operation and can give very good weight loss results. It is usually performed using keyhole surgery via incisions in the abdomen. Once the band is placed and you are back onto a normal diet the band needs to be adjusted until it reaches an optimum fluid level in there. This involves injecting a saline solution into the band via a port which is stitched to the muscle in the abdomen. Many adjustments may be needed until this optimum level is reached. Once it has you should be able to eat 3 small, children sized meals daily and not feel hungry in – between meals. Think about it carefully, ensure you do your homework and find a reputable Bariatric Centre with good reviews. Have a good read through all the info on this site and chat to our members on the forum. This is a great chance to see exactly what is involved with the band before you go ahead.